Party on the Plaza: Morocco’s Jemaa el-Fnaa | Oh, the Places We See . . .
Birds-eye view of the Marrakech plaza known as Jemaa el-Fnaa. 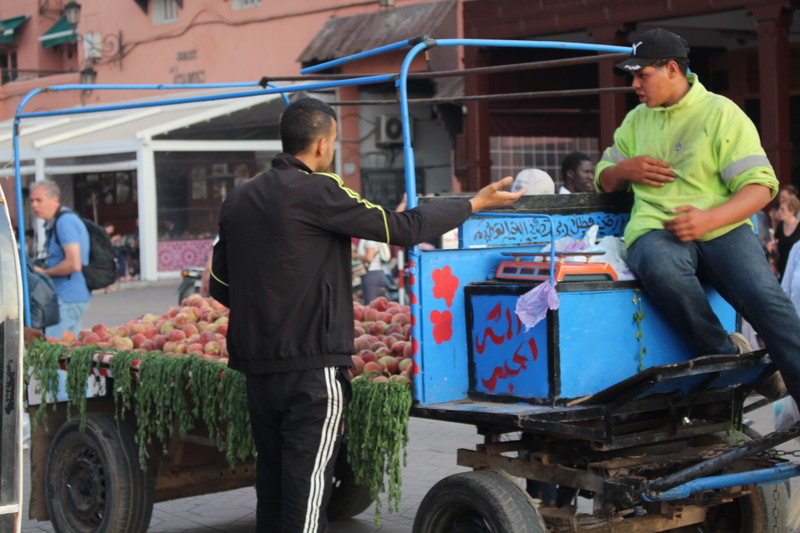 If you enjoyed seeing the Marrakech medina — that dizzy meld of colorful goods in tiny shops — then you’ll love passing through the giant plaza to get there. But caution: you’ll stop and stare. A lot. The name, Jemaa el-Fnaa (sometimes spelled Djemma el F’na) means “assembly of the dead,” since it’s been the site of public executions since 1050. In all the world, Jemaa el-Fnaa could be one of the most memorable public squares you’ll ever see. A lady applies henna designs to the hands of a customer in a temporary booth on the plaza. During the day, it’s a market place where hawkers of all things Moroccan set out hand carved camels, rugs, and pottery. A seller of carved wooden camels waits for buyers in Jemaa el-Fnaa. Carts filled with produce file past you, making deliveries or selling to customers right on the spot. But come 5:00 or so in the evening, and Jemaa el-Fnaa starts puts on its party hat. Vendors open up big green tents showing off rows and rows of colorful fruit and trinkets tourists love. Stalls open up offering fruit and tourist trinkets on the plaza known as Jemaa el-Fnaa. Fruit stall No. 18 with tidy rows of bottled water, oranges and other tropical fruits. Looking like a patchwork quilt, rows of nuts and dates wait for customers. And sellers of live snails offer you a to-go cup so you can steam ’em at home. A seller of snails ready to scoop up a ladle full for you. Need a bigger meal? Men in green tented stalls fire up the grills offering cooked meats with sides of couscous, tagine vegetables, and olives, of course. You’re not in Kansas anymore: heads and meat ready for purchase in Marrakech! The real party, though, is center stage where monkey handlers beckon you to come in closer. Not to worry. A few dirhams is all it takes for a photo as close – or as far away – as you care to be. A monkey handler shows off for the camera in Jemaa el-Fnaa. Snake handlers lay out their best cobras and patterned slitherers sure to elicit an “ooh, ah,” or more likely “I’m not coming any closer” from the crowd. At dusk, the cobras come out. This is as close as I wanted to be. In the background, the thumping vibe of African drums and metal clappers draws you closer to red robed dancers who invite you (most persuasively) to line up and stomp to the beat. So we did. Here’s Chef Joanne Weir who brought our group from Culinary Journey in Morocco 2018 to the plaza. And then, like the good sport she is, started movin’ and groovin’ Marrakech style. If you only get one chance to dance in Jemaa el-Fnaa, take it. Chef Joanne Weir did. On our second visit to Jemaa el-Fnaa, we found an even better place to see this aggregate of sights and sounds: up top at a restaurant balcony. For the price of an orange soda, we nabbed premium seats for the unfettered chaos below. If you’re squeamish in crowds, sit this one out. Go sip hot tea in a posh, beautifully tiled restaurant. But if you’re looking for sensory overload from hard-driving music, the whoosh of undirected vehicles, foreign foods in outrageous stalls, and people moving willy nilly in and among and around, you have to take in Jemaa el-Fnaa. Only in Marrakech. Follow us in Morocco by clicking onto Travel Series: Marvelous Morocco. And to see pictures, head to our Flickr account, Marrakesh album. This entry was posted in Destination, Marvelous Morocco, Morocco, Travel and tagged henna, Jemaa el-Fnaa, Marrakech, medina, Morocco, snake handlers. Bookmark the permalink. Thanks so much, but it was the place, for sure. This is an incredible spot in the world — people of many nations are there, but also the locals bring culture to the foreground. I’d go back in a heartbeat! What an interesting place! Thanks for the report. My only concern are the animals presented there. I can’t imagine that they are kept the way they should – if you can keep an animal in captivity in the way it should at all. Thanks for your perspective. I wondered the same thing. And I’m not sure the animals are kept well. I do know that the livelihood of the people showing off the animals depends on the health and well-being of the animals, so it behooves the trainers to treat them well. But there’s no way of knowing if they do. I agree: usually there’s no way for us tourists to judge if the animals are treated well. A blooging friend of mine, from germany, a horse lover and owner of a horse herself. wrote some time ago about how badly horses are treated over there. She knew, and she had examples. As to horses: sometimes, for example here in San Antonio, those horses pulling the tourits carriages are definitely not treated well, having to stand in the full southern Texas sun on the hot asphalt for hours when there are no tourists. And only recently the city of San Antonio EXTENDED the hours the animals can be made to work! Rusha, you’re incredible! Yet again, another amazing post! I love them. 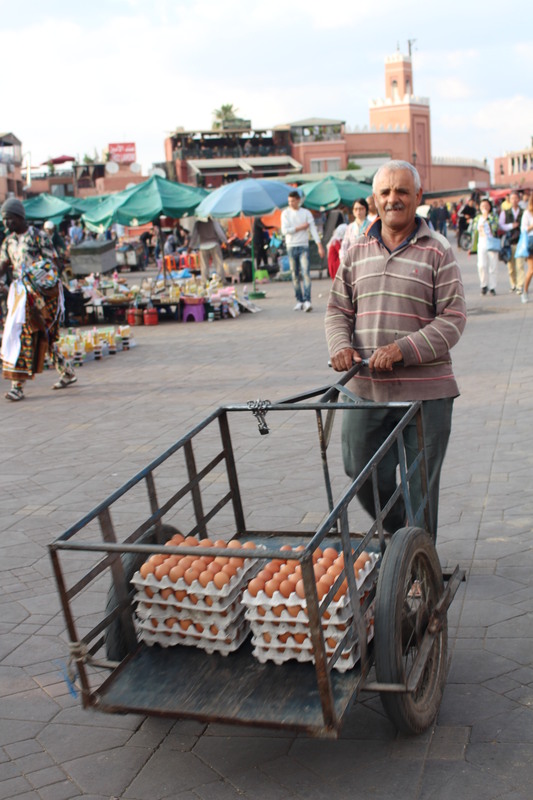 You love Morocco like I do and it shows with your lovely writing and blog posts. Thanks for sharing. Thanks, Joanne. You were such a good sport to join the African dancers. And what fun we had looking at all the vendors, snake handlers, and music makers. What a place! You’re right — I loved Morocco!